Fishing has been rated good this week in Charlotte Harbor. Anglers fishing with me caught snook, redfish, seatrout, bluefish, pompano and ladyfish. 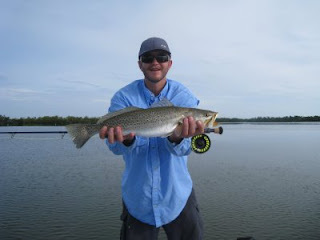 Most fish came to a variety of flies including Puglisi patterns, Clouser Deep minnows and Estaz Marabou flies. The lures we used included DOA Cal jigs, Cotee jigs, Rip Tide and Exude swim baits and Johnson Sprite spoons. The photo above is of a nice seatrout taken by Kevin Terry from Colorado on a Clouser minnow near Whidden's Creek. Cindy Stanley and her Texas Belle sister fished Sarasota with me and caught bluefish, seatrout, ladyfish and pompano on jigs and flies. Pete Smith and his friend Klaus caught redfish, seatrout and pompano in Bull Bay later in the week. Dusty Sprague and I caught redfish to 7 lbs. in the Peace River on Monday. Will Hallett and Charles Grudzinskas caught redfish, seatrout and ladyfish on a windy Tuesday on spoons and jigs. Byron Stout, a popular Outdoor Editor from Ft. Myers, joined Dusty Sprague on Wednesday. Dusty caught redfish to six pounds and a nice 28 inch snook in Turtle and Bull Bays. Kevin Terry, a wildlife Biologist from the Apache Indian reservation in New Mexico, and his femme-fatal, Stephanie caught seatrout to 25 inches, bluefish and ladyfish on fly in Gasparilla sound on Sunday. The variety of fish caught and the appearance of baitfish schools indicate improved fishing for the next week. Look for continued good fishing for seatrout and redfish with snook getting better everyday. Pompano are plentiful but scattered throughout Sarasota Bay and Charlotte Harbor. I hope you all get a chance to fish this month. Good weather and clear water make the fishing very enjoyable.